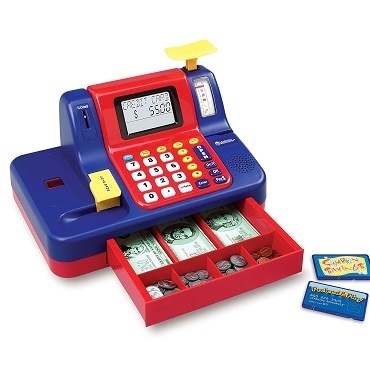 The Toy Cash Register by Learning Resources teaches money skills to children and handling money responsibly. They incorporate pretend play and they are a great way for kids to improve their math and number skills. Children count, learn numbers and perform math operations such as addition and subtraction. They are usually appropriate for kids ages 3-10 and modern toy cash registers feature an LCD screen that displays the tally, a math game and a talking scanner that generates prices and fun messages. Children usually find them very amusing and the more they play, the more they improve their math skills. Melissa & Doug's Play Money Set is a classic pretend play toy that introduces your child to currency, addition and subtraction. Your child practices addition and subtraction all while having tons of fun. This toy money set can be played by children 3 years old and up, and usually features pretend bills and coins kept in a wooden cash drawer. Children use their imagination in order to create new money games such as play grocery store. So the toy also increases your kid's creativity. There are many money board games in the market. They teach your children math, they are really fun and they can be played by the whole family. The Buy It Right Shopping Game can be played by the whole family and is suited for children aged 6 years and up. Children improve their math skills all while having fun. The game consists in cards which represent shopping carts, a dice and a board. Children roll the dice, go shopping with play money, pay, calculate the change, and try to fill their shopping carts faster than other players. It is one of the fun educational kids games that we highly recommend and that can help your kid improve his math skills in no time(addition and subtraction). Monopoly (and Monopoly Junior) is a classic board game that needs no introduction and that we also recommend. It is both educational and enjoyable. Kids learn to handle their money well and by doing so they learn to count, add, subtract. Monopoly Junior is especially designed for children of a younger age.